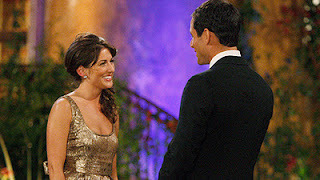 Jillian Harris captured America's heart on Bachelor season 13. Bachelor Expert readers have voted her The Most Fashionable Bachelorette . Her fantastic sense of humor, and hot dog test captivated many. Jillian was the third runner up on Mesnick's season, and ended up season five Bachelorette. I was thrilled to get to see more of Jillian's fashionable clothes. Her dresses, scarves, and boots are to die for. I will share with you my favorite Jillian outfits. If you have other looks, you can send them to me. 1. I love this dress. Sequins and the color gold are two of my favorite things. Jillian looks precious in this dress. 2. This black ruffle dress is fabulous. I think it is difficult to pull off a strapless dress, but Jillian does perfectly. 3. Another great gold dress. This is a perfect premiere dress. I am a major fan of short dresses and side ponytails. 4. Romper + yellow shoes = perfection. I talk badly about rompers a lot, mostly because I am positive they would look bad on me. This romper looks fabulous on Jillian, and I love the yellow shoes. 5. Jillian's Bachelorette premiere outfit. I love the color, and it is a perfect halter. I also really loved the back of this dress. All of Jillian's clothes are amazing, I could not fit them all on one post. She is a really great girl, and no wonder she won Most Fashionable Bachelorette. If you want to know where to get these clothes, you can go to possessionista.com. You can watch her on Extreme Makeover Home Edition or visit her website jillianharris.com. She also has Twitter @Jillian Harris. Happy Fashion Friday. It is really a helpful blog to find some different source to add my knowledge. if you are bloger and want promote your lifestyle, beauty and style blog Contact with us.